Last updated 15 August 2017 . By Faith Strickland. In the Strickland family, we have one answer to life’s conundrums. While some people turn to tea, we turn to Indian takeaways; mum away? Order an Indian takeaway. Time to kill before the cinema? Let’s head over to an Indian restaurant. When living in Italy, the food I missed most was poppadoms and tikka masalas. It seems I’m not the only one with a bit of a love affair with Indian food, as Mint Leaf in Piccadilly has pulled in everyone from Biebs through to Daniel Radcliffe; I went down to put it through some rigorous Strickland testing. Slap bang in the middle of London, Mint Leaf is in worryingly close proximity to prime tourist dawdling territory, moments from Trafalgar Square and Pall Mall. Before you put it in the ‘place to take out of towners when forced to go central’ box, Mint Leaf isn’t like that. 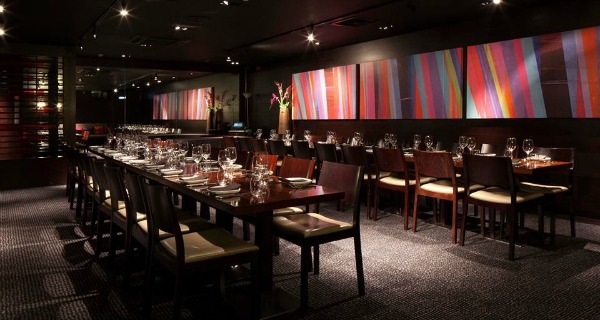 A cool subterranean basement bar and inconspicuous glass doors, give the restaurant a ‘strictly in the know’ vibe. Downstairs, the venue is huge, saved from feeling like an underground carpark with lots of intimate touches, from dark wooden slatted walls that separate eating areas through to subtle private rooms accessed by sliding doors. On a Friday night, the leather-sofa lined bar is full of suits ready to start their weekend. Mint Leaf is clearly up to the challenge as a saxophonist steps up to a small podium in the corner of the room and starts to blast out ‘Despacito’ and other chart songs. The restaurant is similarly swanky with couples occupying booths, and despite the open plan, dining feels intimate with low lighting. Mint Leaf in Piccadilly is a cavernous bar and restaurant in the heart of London. While many of us think of Indian food as a comfort dish or something to soak up a few Friday night drinks, Mint Leaf has a big fat ‘fine dining’ stamped on it. Forget chicken korma, dishes at Mint Leaf feature meats such as rabbit, duck and game, all cooked until butter-soft. Appetisers are a similar Asian take on favourites. We kicked off our meal with kurkure asparagus (£12); a selection of asparagus fingers dipped in batter, fried and served with a spicy sweet sauce - if only all vegetables came this way, I might get a few more of my five a day. A lot of the restaurant’s dishes are designed to share including starters from the grill. Mahi Gulmarg (£15) was a spicy rich dish of baked salmon that was cooled down by raita, while the Lamb Seekh Kebab (£15) had a chilli, ginger and mint bite. Mains were similarly as rich, we went for the waiter’s suggestion who also paired cocktails with each dish. Bhuna Kargosh (£23) was a warming deep dish of pot-roasted rabbit which had been tossed in garlic and ginger. By the time dessert came, I was ready to be rolled from my seat; fortunately the Indian Dessert Sampler (£9) was bite-size chunks of sugary deliciousness with three traditional Indian sweets. Cocktails are just as swish as the food menu. If you have time, head to the bar before you eat, as the espresso martinis are dangerously drinkable, especially combined with live saxophone music. Along with classics, the bar has created their own mix of drinks; Mint Leaf Garden (£12.50) is so refreshing you might forget how much gin you’re drinking as Bombay Sapphire is mixed with fresh cucumber, mint elderflower, lime and apple juice. Dishes at Mint Leaf are a delicious fusion of seasonal meat and Indian flavours. It may count the likes of Christopher Biggins and Justin Bieber among its fans, but, most importantly I like to think, it counts me as a fan. 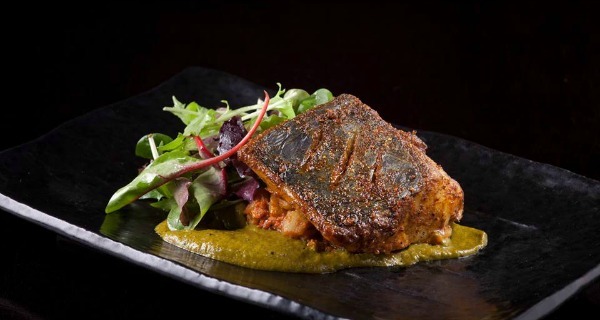 Mint Leaf showcases Indian food at its delicious best with traditional Asian flavours mixed with unusual cuts of meat and fresh cocktails, perfect for something different in Central London.